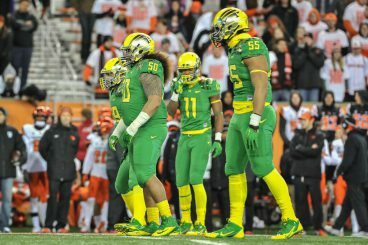 While Duck fans know Oregon football for its high-powered, speed-kills offense, they also know the Ducks have a nagging need to get bigger and faster on defense. Enter Austin Maloata, a true sophomore defensive lineman looking to move up the depth chart this season. 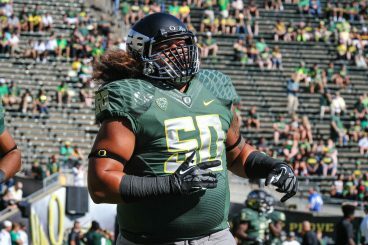 While he didn’t play much his freshman season, Duck fans should look out for his intimidating 300-pound frame, topped with his trademark long, poofy hair, when he steps onto the field this fall. Maloata lines up to do battle against Michigan State. Maloata’s story began in Leone, American Samoa, where he initially played high school football at Leone High School. While growing up in this environment made him a relative unknown to recruiters, he developed his skills within a culture that takes pride in a tough, physical brand of football. In 2012, Maloata made the move to Corona, California, to gain more exposure. He made an immediate impact at Centennial High School, recording seven tackles in his debut as a Husky. Overall, he made 30 tackles and recovered a fumble during his lone season playing for Centennial head coach Matt Logan. It didn’t take long for Maloata to get noticed. A man of his size and athleticism is a prime recruiting target for any school needing to add depth along the defensive front. His high school accolades included a CIF All-Inland Division selection, and Scout listed him as one of the West’s top 150 honorees. Offers immediately came in from USC, Washington State, and Arizona State. 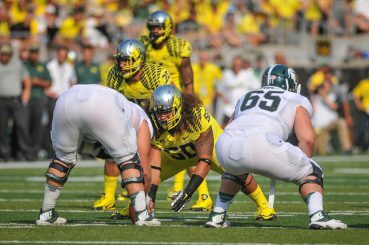 For a while, it didn’t look like Maloata had any chance of coming to Oregon. The 3-star recruit’s attention was largely focused on USC during the 2013 recruiting season. Growing up a USC fan and watching the likes of Troy Polamalu, the Trojans were an attractive landing spot. In May, 2013, Maloata immediately gave a verbal commitment to USC after receiving his offer. Maloata’s huge frame is sure to intimidate opposing teams. But Maloata’s recruitment did not end there. What seemed like the perfect marriage between the Trojans and Maloata soon fell apart. After USC interim head coach Ed Orgeron resigned from his position in December, 2013, new USC coach Steve Sarkisian cooled on Maloata. He decommitted from the Trojans in January, 2014. “I’m just disappointed how slowly I left the picture after I was committed since the first day USC offered me,” he told Hank Shaw of Reign of Troy. Not long after his decommitment, Oregon came into the picture. He had family ties to the school, as his cousin Janitah Iamaleava played for the Ducks women’s basketball team. In February, 2014, he officially committed to Oregon. Though only a 3-star recruit, Maloata’s ceiling is high. He played as a true freshman during the 2014-2015 season, and started his career with a bang, recording career-high four tackles in the season opener against South Dakota. But the backup defender was relatively quiet after that, recording nine tackles on the season overall. The experience he gained, however, was invaluable. Maloata made the most of his limited time in 2014. 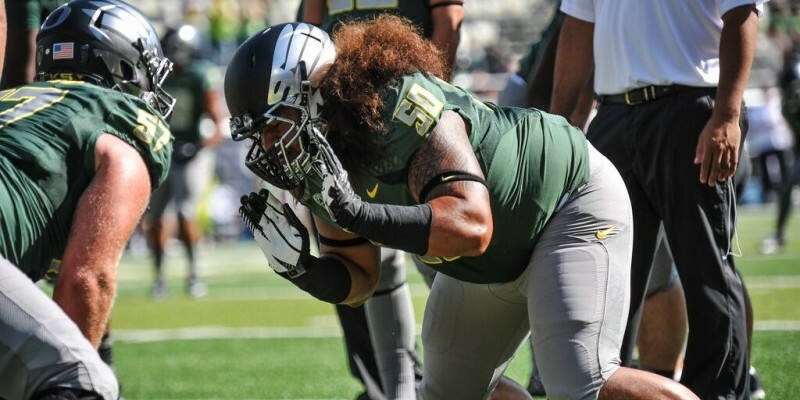 While the departure of Arik Armstead will open up the door for defensive linemen to move up on the depth chart, Maloata will likely focus on nose tackle. In particular, look for Maloata find snaps when senior starter Alex Balducci is off the field. Slowly but surely, Maloata is gaining more responsibility as he enters the next stage of his collegiate career in Eugene. Though he is likely a year away from a starting position, Maloata should see the field more in 2015 as a regular member of the two-deep. For Duck fans, the big Samoan is certainly a welcome addition.